Tucked away near the southwest corner of campus, down the quiet enclave that holds the Department of Earth Sciences and the Multi-Faith Centre, a small, unassuming building houses the Graduate Students’ Union. On the first floor, there is a small, pleasant pub and a neglected gymnasium. Climbing the stairs to the second floor, the mood completely changes. The space opens to a bright café, illuminated by sunlight and decorated in a piecemeal fashion — a juxtaposition of mismatched wooden tables and chairs and inviting cushions, with drawings of vegetables adorning the walls. A map of southern Ontario occupies a portion of a chalkboard wall. Lines radiate from Toronto to the farms outside of the city from which the café’s fresh produce arrives. It is an inviting space, welcoming patrons from the chill of winter. A handwritten menu outlines the week’s features. The standard meal is the Bumper Crop, which offers a main of either black bean and butternut squash mash or hot beet borscht, both accompanied by a seasonal salad, home-baked bread, and hummus spread, all for around five dollars. If you can’t decide which main you’d like, you can get the Double Bumper. Harvest Noon is one of U of T’s last well-kept secrets. The establishment celebrated its three-year anniversary just last week with a dessert potluck. Harvest Noon board member Jessica Denyer describes it as a “student and community run vegan co-op café,” mainly operated through volunteer work. In addition to their main dishes, you can purchase salads, soups, fruit, baked goods, and fair-trade coffee and tea. These options cost anywhere from $2 to $7, depending on the combination. Take-out containers can be purchased for $0.50, though the atmosphere of the café is a significant part of the dining experience. The fare is versatile; the hearty cornmeal soup, the baked bean potato mash, and the potato latkes have been popular menu items this year. Desserts at Harvest Noon are delightful and portable. Cakes and cobblers are the most common and are almost always gluten-free. The food and the space are the product of dedicated staff. To consistently create satisfying and enjoyable meals with locally sourced produce in the middle of the Canadian winter seems like a challenging goal, but it is one that Harvest Noon consistently achieves. According to staff, the method is simple: planning, many test runs, and lots of grains and legumes. “We have to test a recipe out, so, you know, we know that it wouldn’t fail,” explains staff member Chechi Liu. Some dishes need to be jazzed up, she says, because winter seasonal vegetables can lack colour. Originally founded in 2011 by the student group Hot Yam!, Harvest Noon’s official name is the Toronto Sustainable Food Co-operative — a more informative, though less inviting, moniker. The café, as Denyer notes, “operate(s) from a broad environmental justice mandate,” which translates into a belief that there is no environmental justice without social justice. As part of that mandate, the café aims to provide information and education to others. “A big part is education, events, and providing a space for groups,” Denyer explains. The volunteers that run Harvest Noon are invaluable, and many start out as customers. Their contributions are essential; invested volunteers lighten the workload at the café, contributing to the relaxed atmosphere for staff and patrons. “It’s a good working environment that provides students with different skills and a place to hang out,” Liu says. Volunteer shifts last two hours and include a free meal. A team of almost 30 volunteers works with five staff members and the Board of Directors to oversee the operations. The co-op is fuelled by a shared interest in vegan, healthy, and sustainable food options, all of which are largely unavailable across the St. George campus. Liu acknowledges the challenges of engaging visitors with the café’s wider mission. Unsurprisingly, he noted that the people who learn the most are usually the ones who want to. The challenges are clear. “Obviously I wish there were more passion and programming going on, but limited resources are a big hurdle,” says Liu. When asked if Harvest Noon would ever expand to a bigger space on campus, Liu was uncertain, saying it would mean a bigger investment on the co-op’s part. For now, however, it seems that the space is serving Harvest Noon very well. Every day, the small café is filled by 1:00 pm, and the kitchen is usually out of at least one main by closing time at 2:00 pm. Harvest Noon’s food comes primarily from the distributor 100 km Foods. The focus is on locally sourced food to optimize freshness, support local farmers, and reduce the co-op’s carbon footprint as much as possible. “It feels really nice to have that immediate support and most of the produce is of amazing quality, and is stuff that you can rarely find in stores, which is a bit strange,” Liu says. This support is part of a symbiotic relationship. Small-scale farms, dependent on seasonal growing, are unable to provide for the varied and specific needs of large-scale restaurants year-round. As much as places like Harvest Noon are dependent on local farmers, the local farmers rely on seasonal, rotating menus like the one found at the café. Before choosing to work with 100 km Foods, Liu did his research. “I actually went and located all the different farms on Google Maps, and there’s a lot in the Niagara Region, vinegar from a Niagara vinery, a few in the west [of Ontario]… it’s quite a big variety,” explains Liu. For some ingredients, extra-regional sourcing is necessary. These include wheat and legumes, which are grown in the prairies. A benefit of locally sourced food is its diversity and quality. “Quality is an issue, just how standardized everything has to be in a lot of grocery stores. A lot of the things we get are not as sparklingly clean as you’d get in the stores,” Liu explains. He adds that a major cause of food waste is the tendency to discard food based on physical appearance alone. With this approach comes more transparency. The produce used by Harvest Noon is all guaranteed to be organic and GMO-free, and often has a Local Food Plus certification. Local Food Plus certifications indicate a commitment to social consciousness in addition to environmentally friendly farming. “We can’t say all our food is local, because some of our seasoning items aren’t as local as we can get. But we’re working on that. We’re considering harvesting Sumac,” Liu notes. Community is important to Harvest Noon’s mission as a socially conscious café. The management of the café is collaborative and co-op oriented. It takes only five dollars or two volunteer shifts to become a member for life and join the ranks of over 1400 others. Membership gets you discounted menu items and participation rights in general meetings. The space itself can be rented for group use, but the café also collaborates with campus groups. Recently, its neighbour, BikeChain, held an event focused on “healthy, nutritious, to-go food” for cyclists on extended trips. One of Harvest Noon’s closest collaborative projects is with Dig In!, the campus agricultural network that is dedicated to small-scale, sustainable food production. Harvest Noon works with Dig In!’s local plots to grow herbs and preserve them by drying them for use throughout the winter. Harvest Noon also works with local groups like the Toronto Seed Library (TSL), an initiative also founded by U of T grads. Its work is “collecting expired seed from stores, or actually even go directly into seed companies and get their expired seed,” says Liu. Despite expiration dates on packaging, most of the seed in a package is often still viable — the TSL collects and redistributes these to the public for free. 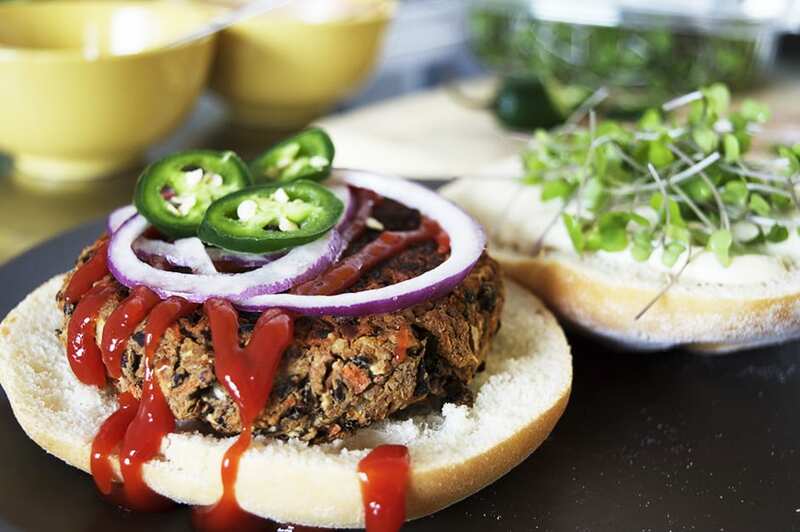 It is common to find many politically and socially conscious minds among the students at U of T. Yet, few on-campus food options can claim to be inexpensive, vegan, organic, healthy-minded, locally sourced, or sustainable. Harvest Noon is all those things, and consistently delicious too. In the future, the Harvest Noon staff would like to see increased programming, including workshops and events. They currently offer menu planning and bread-making opportunities, and Liu wants to increase preserving and pickling of fruits and vegetables in the off-season. The café’s charm is certainly undeniable. Spending time immersed in the smells of squash mash and fresh-baked bread is a blissful retreat from the winds billowing outside on campus in the February cold. Try these fresh, locally sourced recipes to warm up this winter! 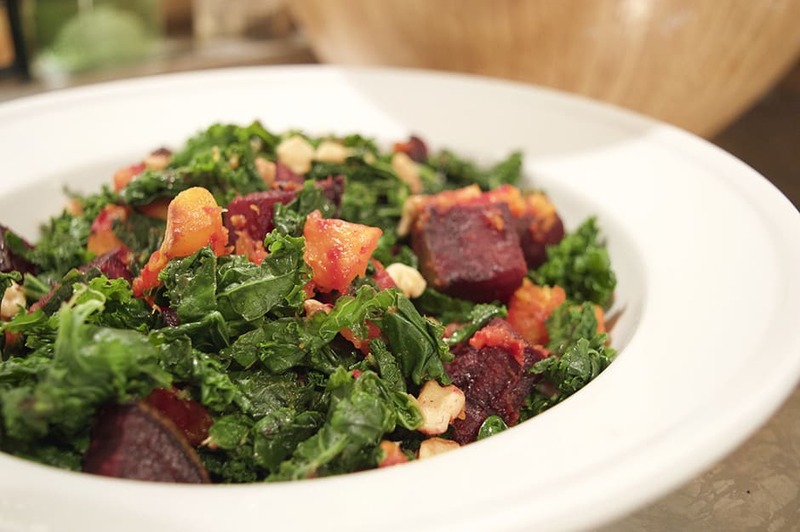 This salad features winter root vegetables grown in Ontario. 1. Heat oven to 375º F.
2. Toss squash and beet with oil in large bowl until lightly coated. Season with salt and pepper. Lay in single layer on baking sheet; cook for 30 minutes or until softened, turning once. 3. When cooked, roast walnuts in single layer for 2-4 minutes until lightly toasted. 4. Add slightly damp kale to large pot on medium-low heat. Blanch kale, stirring often, until cooked through; about 5 minutes. Blot with towel to remove excess water. 5. Add all ingredients in large salad bowl and toss with dressing of choice. Serves 4. Black beans are grown in Ontario and Michigan and are sold year-round. This burger is topped with kale sprouts fresh from farms in the GTA. 2. To make flax egg, whisk 3 tbsp ground flax with 1/2 cup warm water in a small dish. 3. Leave mixture in fridge for at least 20 minutes, or until it reaches an egg-like consistency. 4. Mash the beans in a large bowl with a fork. Leave some of the beans intact for texture. 5. Mix in onion, almond, carrot or zucchini, and seasonings. Add flax egg; stir to combine. 6. Add breadcrumbs until consistency of patty mixture is just wet enough to hold together. 7. Form into patties and place on greased baking sheet. Bake for 15-20 minutes, until golden and firm in the middle. 1. Add ingredients to blender or food processor. Pulse until smooth.